BRASÍLIA— The 2012 General Census of Senegal will benefit from state-of-art information gathering and processing technologies used by Brazil, thanks to a South-South Cooperation initiative established between both countries with support from UNFPA. A partnership signed last week will allow ANSD, the National Bureau of Statistics and Demography of Senegal, to share the Brazilian experience with personal digital assistants (PDAs) for conducting a large-scale, paperless national census. 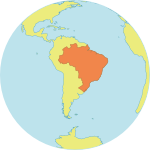 This methodology was developed by the Brazilian Institute of Geography and Statistics (IBGE) during its national surveys of 2006 and 2010. By using PDAs, field researchers can collect and send data to databanks where information is consolidated and processed in real time, ensuring greater reliability and faster production and dissemination of results. A total of 20,200 PDAs will be lent by the Brazilian Institute to assist with the General Census of Population and Housing, Agriculture and Livestock of Senegal, which is due to start in December. The first shipment of 150 devices will be sent immediately for a pilot test. IBGE will provide technical and logistical assistance, including the mobile GIS software that will help identify the location of registration areas. During the 2010 Brazilian National Census, some 220,000 researchers with PDAs were deployed to cover the entire country. 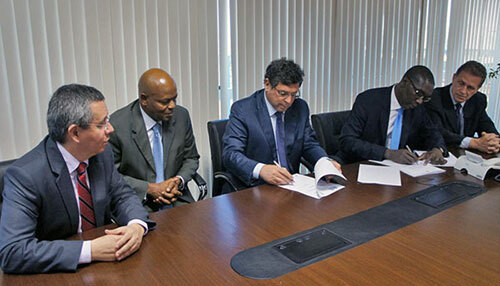 UNFPA Offices in Dakar and Brasilia were involved in the negotiations that resulted in the 5-year agreement, signed last week by Abdoul Aziz Ndiaye, Ambassador of Senegal in Brazil; Marco Farani, Director of the Brazilian Cooperation Agency, and Nuno Duarte da Costa Bittencourt, acting Executive Director of IBGE. During the signing event, Ambassador Ndiaye recalled the historical positive relations between Brazil and Senegal and expressed his satisfaction with this initiative: "This technology is very important for the General Census — we will make good use of those PDAs." The Brazilian Embassy in Dakar will follow-up and provide support to the initiative, according to Marco Farani. Cape Verde is also providing technical assistance to the effort. The agreement builds on several important institutional directions for UNFPA — to strengthen the capacity of countries to be more effective and efficient, and to encourage programme countries to share their relevant skills and expertise with other programme countries. This particular example has been selected for documentation as one of UNFPA's 'good practices' and further details on how the collaboration worked will be available. UNFPA is also committed to ensuring that every country has the technical and financial resources to implement a census, one of the most complex and massive exercises that a country manages during peacetime, and a critical planning tool. The Brazilian institute has received several other requests for cooperation on Census from other countries and is organizing an international seminar that will bring together 18 countries to share experiences. The seminar is a joint initiative with UNFPA and the Ministry of Foreign Affairs of Brazil. "We are working in South-South cooperation initiatives involving IBGE since the 1980's," explained Harold Robinson, the UNFPA Representative in Brazil.